A dash of distinction makes all the difference. Preferred by world-class chefs for its cutlery-grade stainless steel grinder and solid maple construction. Full grind range from coarse to fine. Holds 3/4-cup of peppercorn. Laser-engraved personalization. Personalize with one large initial and up to 14 characters/spaces per line (4 lines total) in gold lettering. What are some of the ideas of personalization you have for the 3 additional lines? Examples of something clever to say! BEST ANSWER: We do not have examples but as long as you follow the number of characters per line the creativity is unlimited. Delivery was very prompt and the pepper grinder arrived in perfect condition. Bought this one as a gift for my Mom after having one myself for 5 years. Expensive, but well made. This was the perfect gift....so beautifully done and so fast! I've bought this twice. I'd buy it again. I'm a real estate agent. It's made for memorable gifts. Simply elegant, this pepper mill brings a smile to the giver and will surely delight the receiver. Wish I had ordered one for myself. . .Santa, are you listening? My daughter and I are creating a food blog using the name tarragon and thyme. I had the Pepper Mill personalized for my daughter and she loves it. A great job for a great price. We saw the pepper grinder in Italy and loved it. So I got my guy one for Christmas and he thinks it's great. Customer Service very pleasant and helpful. Great communication and status updates by email. Super FAST and SECURE shipping and handling. No complaints!! Very unique and functional gift! Or, for personal use! I bought this product for my fiance. He loves pepper and always wanted something like they use in restaurant. The ability to personalize it made it even more special and sentimental. We will get plenty of use out of it! This was a wedding gift, and sent directly to the bride and groom. I didn't see it until visiting after their wedding. The couple loved the Pepper Mill and couldn't wait to show it to me. 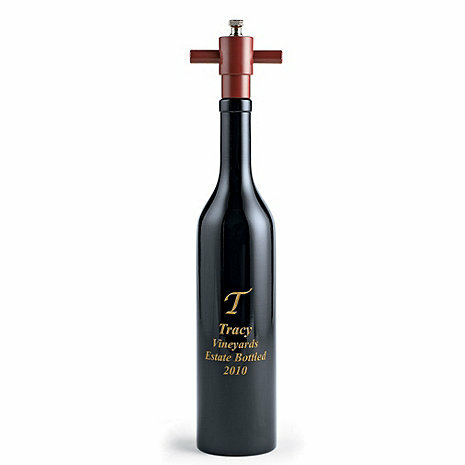 It is very beautiful and functional, and the perfect gift for the wine enthusiasts. The ebony wine-bottle shape of this pepper mill, with its burgundy colored top & gold lettering is quite stylish. The size & quality make it useful, too. Not just an ornament. We love ours, and have personalized it as a fun gift for others. I'm sure we'll order it again. The perfect gift for the 'foodie' and/or "wine-lover' that has everything! Unique, memorable, a conversation piece for years to come! I hope the quality is there for it to last! it looks great. it is hard to fill it with the peppercorn and if you don't want the pepper to be ground super fine when you adjust the control at the twist top it feels like its going to fall off. it is wobbly.